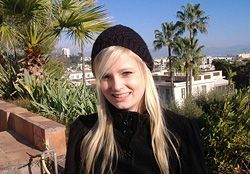 My language course: Learning the lingo in Antibes! I took part in a French language course in Antibes, France, a couple of years ago. It was a truly amazing experience! Read on to find out about my time at the school! This old and idyllic French town overlooking the Mediterranean sea inspired both Monet and Picasso. You can definitely see why! The scenery around Antibes is breathtakingly beautiful, on one side of the town you’ll find the glittering blue sea and on the other a dramatic mountain landscape. The sun shines here almost everyday and the old town is full of quaint, cobbled streets filled with flowers. A year and half ago I started to study French back in Slovakia and I found it very complicated. The most difficult language I have ever learned!!! Luckily everything changed here in Antibes. I would never have imagined that the language could be taught in such an interesting way. In 2 months I have learned more than during 1 year back at home. During my stay I met a lot of nice people from all over the word and we visited lot of interesting places. 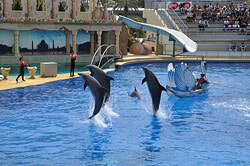 My most amazing experience was our visit to Marineland (the big aquatic park next to Antibes). The killer whales show was really surprising. I was impressed at how high these beautiful giant can jump. In spite of their name “killer whale” they are really friendly and affectionate. They kissed each other under the water – it was so cute. Antibes – Let’s go to the circus! I’m Carmen and I come from Spain. 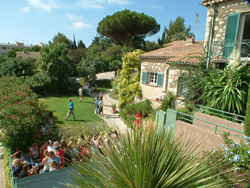 I’ve just spent 6 weeks in a French school in Antibes. In short, everything was great! However, I was particularly impressed, touched and delighted by one special evening I spent with my friends in Nice. We were really lucky to see the Arlette Gruss Circus show! This is the one of the best circuses in France and it goes on tour every year, performing all over the country. It has taken a year to prepare their new show and it was performed for just one week in Nice (only 20 km from Antibes). I really enjoyed the course. Though I chose to take an Intensive course and was therefore at school from 9 – 4 (with a long lunch break) Tuesday- Friday (9-12 on Monday), it didn’t really feel like I was spending much time in class! The hours simply flew by! Morning classes focused on grammar, while the afternoon classes were like conversation groups. The sun doesn’t set until 9 or so, so you still have plenty of time after class to hit the beach or go on excursions and activities organized by the school, even if your lessons don’t finish till four. My accommodation was nice and there was a great sense of community there, probably because of the patio/kitchen/ bar area. 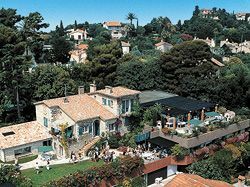 The residence I stayed in had a great location near the beach at Juan les Pins, close to a grocery store, and within walking distance of the school and Antibes. I had 3 roommates over my 5 weeks, all from different countries. Warm sunny days in Antibes! This year I had a chance to spend my Easter holidays in France. 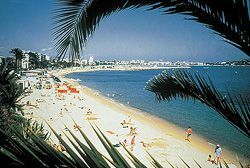 I just have to say how lucky I was to go to the school that I did in Antibes. The whole experience has been amazing! I’ve never had such an incredible Easter break! First of all, after the cold grey winter weather in Russia, I just couldn’t believe the warm climate of the French Riviera! It was so great not to have to put on my long hot coat that I had been wearing just a day before in Moscow, but instead only a light top, or T-shirt. Then, of course, I simply loved all the vibrant colours of Spring in the South of France: green palm trees, gently swaying in the warm breeze, fabulous blue skies without any clouds, and the deep blue of the sea, sparkling in the sunshine.. From the moment I arrived I loved the bright, happy, colours of Antibes, and couldn’t believe how it could be so warm and sunny here when it was so grey and cold in Russia! 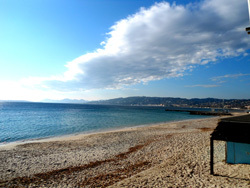 If you are looking for a real taste of life on the Cote d’Azur, you HAVE to go to Antibes! Palm trees along the sandy beach front, quaint French markets alongside a glamorous yacht filled marina, fabulous clear blue skies and sunshine, yummy seafood restaurants… I loved Antibes! 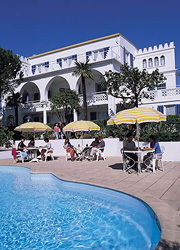 There was nothing more relaxing than sitting out on the sun terrace of the French school where I was taking a course, and basking in the sunshine after classes, enjoying a tasty lunch from the school cafeteria, and taking in the amazing view of the Mediterranean. After that, I would have the difficult task of deciding what to do in the afternoon… whether to head down to the beautiful sandy beach, or take a refreshing dip in the swimming pool at my residence. Or whether to be energetic and take part in a school activity such as the volleyball tournament, or head into the beautiful countryside to take part in rafting or mountain biking, or go sailing down at the marina. Or maybe I should indulge my cultural side and visit the famous Picasso museum, or one of the lovely hillside villages famous for their artisan works. You see, in Antibes, you have the best of everything! Antibes is a charming town on the French Riviera. There is everything we need to enjoy a nice life. For instance the little café where we can drink an espresso, talking, while our face is warmed by the sunbeams. My god, everything is perfect! 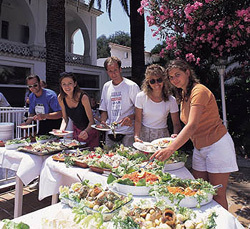 If you do not believe it, read the following… I will describe a full day in Antibes! To start with, I would like to relate a day during the week when I go to school as I am participating to a 3 month language stay. At 8 o’clock, my alarm rings, it is not unpleasant as the sun is already shining. Then I take a short shower being enticed by a smell! Mmh… It‘s the smell of a coffee! Like the rest of France, our dear Stephane is shouting out the phrase: ”Beaujolais Nouveau has finally arrived!” Every year on the third Thursday in November the new wine is published, and not a minute before. In France this is an old and strong tradition, and it is also famous in the rest of the world. The ritual is the same if you are in Lyon, Paris, New York, Rio de Janeiro, Tokyo, London or Oslo, and also in our school in Antibes. The school staff has arranged a free tasting of the new wine, and it was a great success. Together with beautiful decoration, bread and cheese, it all created a good atmosphere under the sun of the French Riviera. The market in Antibes is the most beautiful and interesting I have ever seen! There are stalls of herbs and spices, traditional baskets, meats, cheeses and all the things you would expect to find. The fruit and veg is so fresh and colourful, nothing like the stuff you get in supermarkets back in the UK. You can even smell the tomatoes as you walk by! There are herbs from Provence that are so good, my dad bought several packets because he so fell in love with the flavour last time he was in Antibes! The people are friendly and passionate about their produce, and it was very interesting practicing my rather shaky French with these lovely locals.